Taken from the album "Journeyman"
Tracks 2 & 3 - Recorded Live At The NEC Birmingham, England during July 1986. What an interesting single LP. 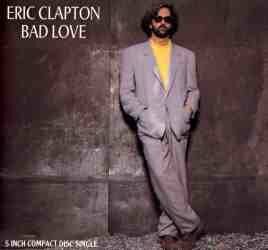 I think Bad Love is some Eric's best guitar work. The solo on Bad Love and Badge are some of the most tasteful things I've ever heard. What an immaculate way of holding notes and changing registers. The vocals shine very brightly in Let It Rain and the bridge of Badge. This is the early vocal sound before he obtained more of a blues grit. The only reason I gave it a 9, was because Badge was on this single. That is a whole other era in itself, and separate from his solo work. 3 top-notch songs!